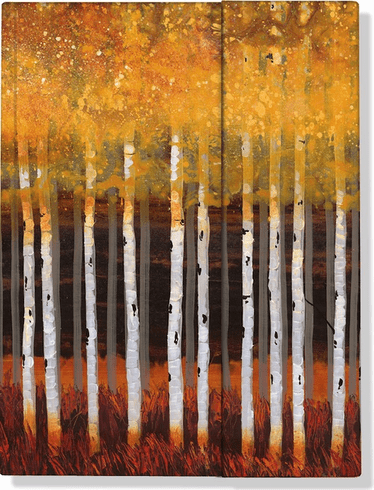 This striking journal features the painting Golden Aspens by popular artist Robert Holman. The journal features raised embossing, glossy highlights, and gold foil accents, plus a foldover panel that closes with a magnet to secure your jottings, notes, and ideas. Makes a great personal diary--no need to worry about a lock or keep track of a key. 160 lightly-lined opaque pages. Creamy-smooth acid-free archival paper takes pen and pencil beautifully. 6-1/4'' wide x 8-1/4'' high. Hardcover journal lies flat for ease of use. Acclaimed artist Robert Holman is an Arizona native; Golden Aspens is his best-known work.